“It’s slimy,” people often say without thinking when you first bring up the topic of okra. Yes, okra is mucilaginous (the technical term for slimy), and no, it isn’t only good fried, as many people attest. Okra is actually a very versatile fresh, crisp vegetable that has a bad rap. The genus Abelmoschus has several cultivated species, but the one that crossed the Atlantic sometime in the sixteenth century was Abelmoschus esculentum. Related to cotton and other mallow family plants, okra is an ancient vegetable that originated in southern Ethiopia in far antiquity. It provides thickness and savor in the one-pot stews that are the basis of many traditional African diets. Spreading across to Western Africa and down into the central part of the continent during the Bantu migrations around 2,000 BCE, okra has been a staple in African and African diaspora cuisine for a long time. 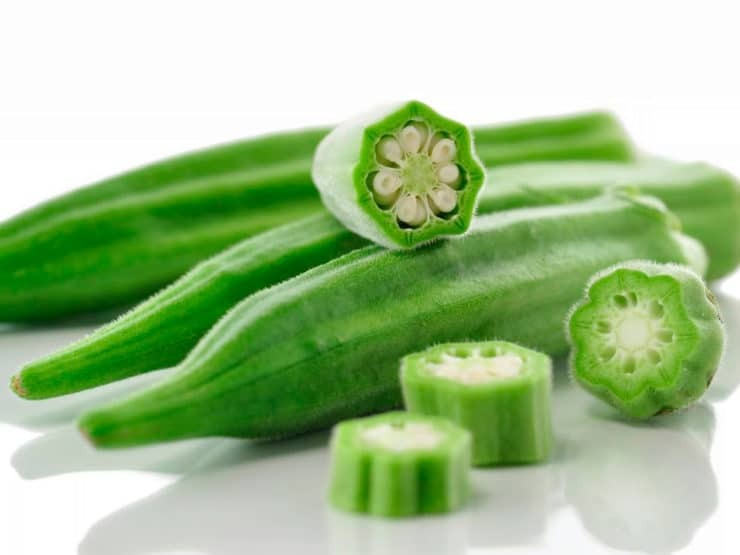 It even crossed the ocean to Asia at an early date and spread with Islam to India, where it is called “ladies fingers.” About the same time okra was making its appearance in Brazil, the West Indies and later mainland North America, it made its way to China and the island of Macau where it bears one of its many African names—quilobo—from Angola. In fact, quilobo is one variant of the KiMbundu word quingombo, where we get the word “gumbo. From the Igbo language of southeastern Nigeria we get the vegetable’s English name, as okwuru became ochra and okra. Along the entire length of the 3,500 mile coast exploited by the trans-Atlantic slave trade, okra was grown and cooked with other vegetables or rice and made into soup. Slave traders had a knack for studying and recording the lifeways of the African ethnic groups they sought through war and kidnapping. The ample primary sources that read as early ethnographies were really guides to inform contemporary traders about the ups and downs and ins and outs of enslaving and exporting specific ethnic groups and Africans from distinct regions. Understanding the food of the people you were enslaving was critical; it ensured they would be well fed on the perilous Middle Passage and when they arrived in the New World. Since most of the early trade went directly to cognate tropical areas on the other side of the ocean, a concerted effort was made to bring familiar food crops along that enslaved Africans could plant to remind them of home. Cruel a business as the slave trade was, it was still recognized that culinary homesickness was a great deterrent to the “seasoning” process. In mainland North America, okra was one of the ultimate symbols of the establishment of the enslaved community as a culinary outpost of West Africa. Noted in Brazil in the 1500’s and in the West Indies throughout the 1600’s, okra was a relative latecomer to colonial America. Our best guess is that it came here at the start of the 18th century. 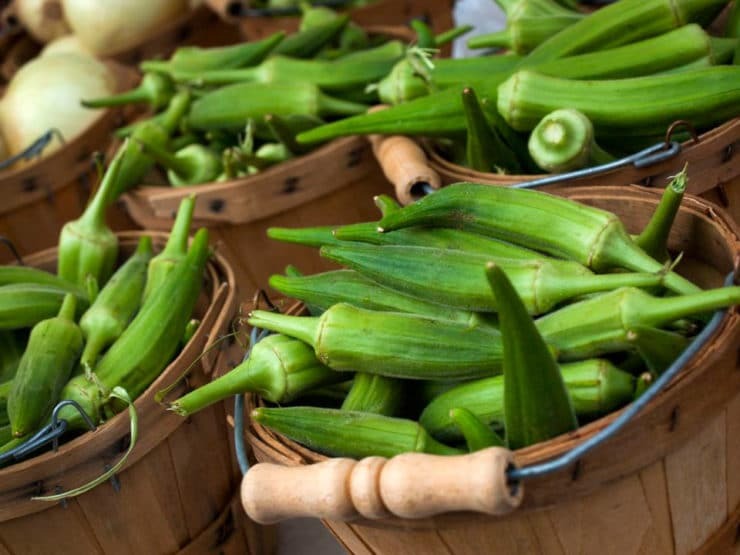 Charleston and New Orleans were early hotbeds of okra cookery for certain, but okra was not confined to the Caribbean outposts of the Old South. Peter Kalm discussed okra in his American travels as a popular plant for soups among blacks and whites in the 1740’s. Thomas Jefferson lauded it as one of Virginia’s esteemed garden plants in the 1780’s, and references to okra can be found in garden records and maps across the early Mid-Atlantic, Chesapeake and Lower South. For enslaved cooks, okra was a common thread in their mixed African heritage. To the Wolof people it was kanja, to the Mandingo, kanjo, to the Akan it was nkruman and to the Fon, fevi. Okra was most often prepared in a peppery stew that was eaten with rice, millet, hominy or corn mush. It was boiled with onions and tomatoes in a saucy preparation that was eaten in the same manner, or it was boiled on its own as a fresh vegetable. Okra with rice was called “limpin’ Susan,” the cousin dish to cowpeas and rice, or “Hoppin’ John.” It was also boiled up with cowpeas for another dish, fried in small pieces with the boiled leaves served as a leafy green. Okra soups became signature and staple dishes throughout the South. It is hard to know where the family tree starts and where it stops. 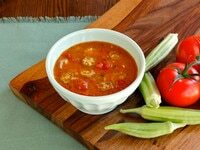 Some varieties of Kentucky burgoo and the Brunswick stew of the Southeastern coast contain bits of okra thrown in with the usual mix of tomatoes, onions and hot pepper. Okra soup thick with crab became Baltimore’s “crab gumbo” and Charleston and Savannah’s “rouxless gumbo,” while in New Orleans the roux made okra soup even thicker. Summer Louisiana gumbo came to mean okra gumbo flavored with chicken, seafood or whatever the seasons allowed. From Mary Randolph’s The Virginia Housewife and her “ochra soup,” to Lettice Bryan’s The Kentucky Housewife, Sarah Rutledge’s The Carolina Housewife and Mrs. B.C. Howard’s Fifty Years in a Maryland Kitchen, it is clear okra dishes passed from the hands of enslaved cooks into those of literate white ladies. These cookbook authors published their favorite versions, leaving us records of regional variations on this classic, ancient dish. Here is a peppery, historically inspired recipe for Okra Soup. 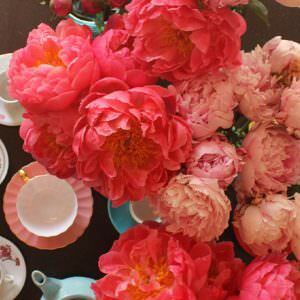 This version is based on recipes from the 19th century, especially those of Mary Randolph’s The Virginia Housewife (1824) and Mrs. B.C. Howard’s Fifty Years in A Maryland Kitchen (1881 edition). This simple DIY heirloom recipe has a few modern updates. 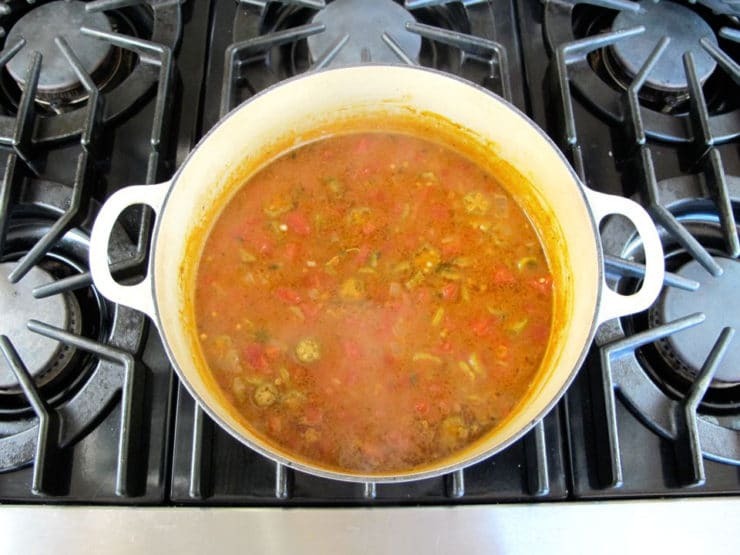 The culinary trinity of hot pepper, tomato, and okra served with rice reinforce this soup’s connection to similar dishes found from Senegal to Angola, and Philadelphia to Bahia. Interesting fact: Enslaved African Americans grew okra and parched the seeds to make a fake version of “coffee.” During the Civil War, it was common to sell this brew to white soldiers, Confederate and Yankee. 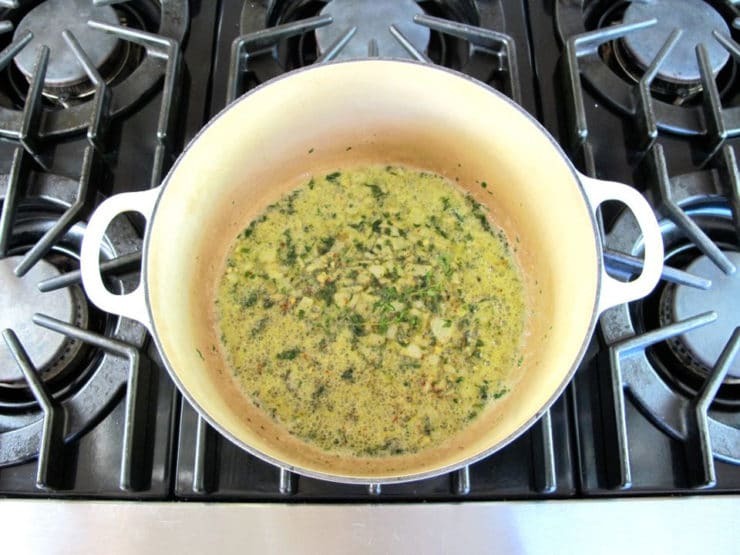 To make this recipe kosher, use olive oil and vegetable broth. The original recipe calls for 1 tsp of black pepper. We have cut it to 1/2 tsp, but if you can tolerate spicier foods, feel free to add the whole amount (or to taste). 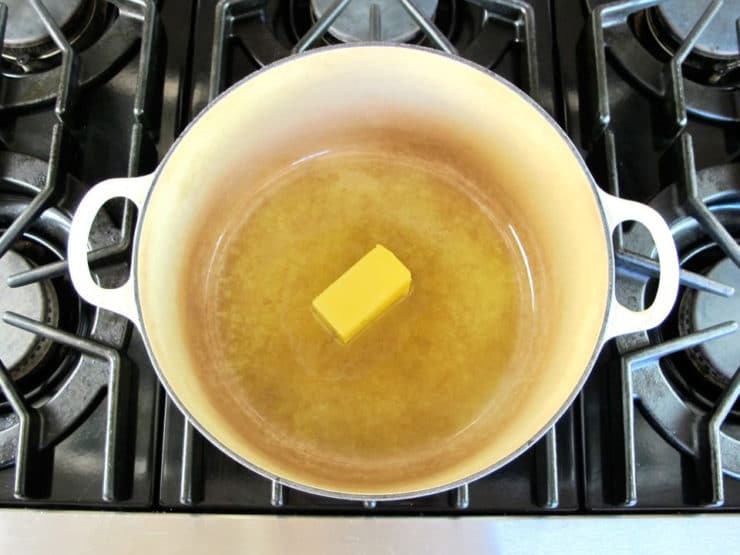 In a Dutch oven, heat the butter and lard or olive oil until melted. 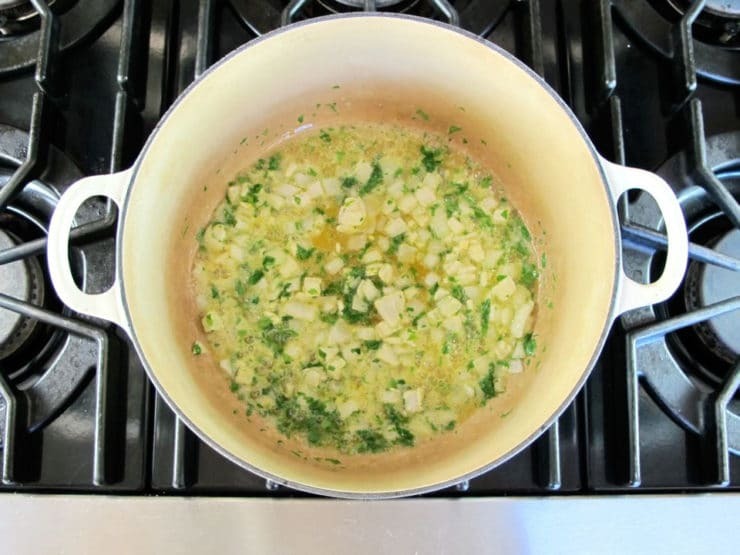 Add the onion and finely chopped parsley and gently cook until onion is translucent and soft. Add the garlic and cook for a minute more till fragrant. Add the thyme, salt, black pepper and red pepper flakes and cook for another minute or so. Add the broth, water and tomatoes and cook on a medium simmer for 30 minutes. Add the okra and cook for another 20-25 minutes, or until tender. Ladle into bowls over ¼ cup lump of warm rice each. Serve. Carney, Judith and Richard Nicholas Rosomoff (2009). In the Shadow of Slavery: Africa’s botanical legacy in the Atlantic World. University of California Press. Berkeley, CA. Grime, William E. (1979). Ethnobotany of the Black Americans. Reference Publications, Algonac, MI. Hatch, Peter. (2012) “A Rich Spot of Earth”: Thomas Jefferson’s Revolutionary Garden at Monticello. Yale University Press, New Haven, CT.
For more information, check out Michael’s entry on okra in the Encyclopedia of the Material Life of Slaves in the United States (2010), Martha B. Katz-Hyman and Kym S. Rice, editors. Greenwood Press, Santa Barbara, CA. THK asks: Are you a fan of okra, or does the slimy texture make you squeamish? So glad to run across your writing here! I first learned of you through your appearance on youtube with Jas. Townsend. & Co. I have been searching for an okra soup recipe and I will give your version a try with some modifications. I am thinking of adding some chopped celery and a bell pepper, though not mentioned in your recipe. I just happen to have the ingredients on hand and I’d like to use them while I can. Coming from one of the oldest slave families in Charleston, the concept of Okra soup is a common staple in our diets and history. We were taught by the older generation, about making Okra soup, Historically during slavery during the holidays, when the gift of meat parts were given to slaves, spare part that the slave owners did not mind parting with of course, the addition of meat was a treat. The use of the fats and old seasoned oils were used when meat was not available. It is a hearty soup that when loaded with smoked meats, bacon pieces and ham, pretty much makes up a combo and a complete meal,of course with the geechee rice! 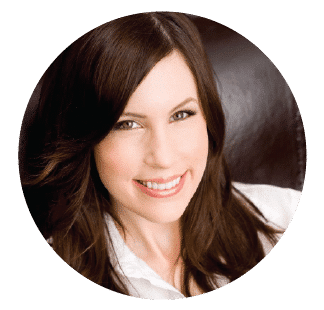 I heard somewhere that there is often a reason certain foods are eaten together—because they complement each other in some biochemical way—and that, interestingly enough, those foods are paired together in traditional dishes, almost like our forefathers knew about this complex biochemical link modern science would later discover. Okra and tomatoes is supposedly one of those. Do you know anything about this? Why they complement one another and historically how they came to be cooked together? Absolutely! I agree 100%. Usually foods grown or raised to compliment each other in nature, for a reason. Tomatoes naturally pairs well with okra and spinache. Lemon juice also “freshen” tomatoe sauce , or tomatoes . It balances the acidity in the tomatoes. Olives , and cheeses , neutralizes your palate and pairs well with wines, especially when taste testing, Certain meats compliment wines as well, and on and on. Salted meats pair with dark leafy greens or okra . I’ve been looking for a recipe for okra soup forever because my South Carolina Grandmother made it. But truth be told, she and my other grandmothers didn’t use recipes. They just threw the food in the pot. The ingredients may have always been the same, but really they never fixed it the same way twice. Still I’ll try this recipe cause I just love me some okra. It along with greens speaks to me. I believe the reason we have so much illness in the African-American community is we’ve gotten away from eating food that is good for us. Instead we eat too much processed food, carry out, etc. That, plus many of us don’t know how to cook from scratch. In Trinidad and Tobago, there is a soup we make called callaloo It is made with dasheen (taro) leaves, okra, coconut milk sautéd onions, garlic, pimentos and culantro. It often flavored with crab and or cured pig’s tails. It is delicious. It can be made with basically any greens. I often make it with beets greens and spinach. My favorite is steamed okra, along with red potatoes, carrots, and onions. I like it cooked up in a stew, as well; in fact, I’m cooking a large pot of chicken-vegetable stew right now, to which I added half-a-pound of cut-up okra and two huge beefsteak tomatoes, coarsely chopped. 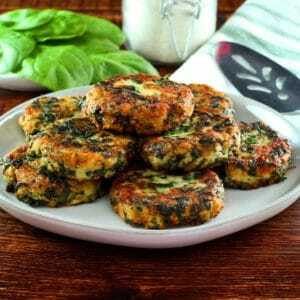 Excellent recipe used herb stock cube as have no access to fresh. From my mother I learned to bake sliced okra with chopped onion & a can of tomato sauce in a covered 13 x 9 pan at 375 degrees for an hour. The baking method prevents most of the sliminess if not all! It works for the bags of frozen sliced okra from the freezer of the grocery store or our home-grown okra. When cooled completely place in zip-lock bags and freeze. Defrost when needed to cook a little longer for a side dish or add to soups and gumbos. Fish gumbo with parsley rice is my most requested Shabbat meal by family and friends. Island of Rhodes. Our recipe for okra removes all the “slime”. About 20 minutes and it dries the okra out…makes it a completely different vegetable! Hi Edith, my grandparents are also from Rhodes. We make bamia (okra) all the time as you wrote but I never heard about the 20 minutes in the oven. Genius. Can’t wait to try! As an Italian lady with a Mexican hubby from NOLA, our kitchen is a delightful ‘mash-up’ of this that and the other. I love using dried beans, hambones, okra, plenty of garlic, hot peppers, or..frying up a mess of catfish in bacon grease with chunks of yam, and then – sitting down to enjoy it with good friends. Believe it or not, some of the best okra I ever found was at a stand run by an Islamic fruit peddler. I came home with the okra he sold me, and made this sublime mix of black eyed peas, ham chunks and okra over rice. Heaven. I think, to really enjoy food you have to be open to new tastes. Yes..okra is ‘slippery..” but it’s also delicious. And classifies we who love it as The Culinary Coolsters!! This soup is pretty much the gumbo we make in my family. Substitute a bit of creole seasoning (red, black and white pepper, chili powder, garlic powder, salt) and add some seafood and presto! With or without file powder (ground sassafrass leaves), it’s delicious. In recent years with the price of seafood going up and the quality going down, I’ve made it with chicken thighs instead, using a bit of O’doul’s low alcohol beer as part of the liquid. Very,very tasty. You don’t know what you’re missing if you’ve never tried pickled okra. Not slimy at all. Fresh Market carries a freeze-dried okra; try pickled first. The freeze dried stuff wants to go a little slimy when you chew it up, but the pickled stuff won’t. 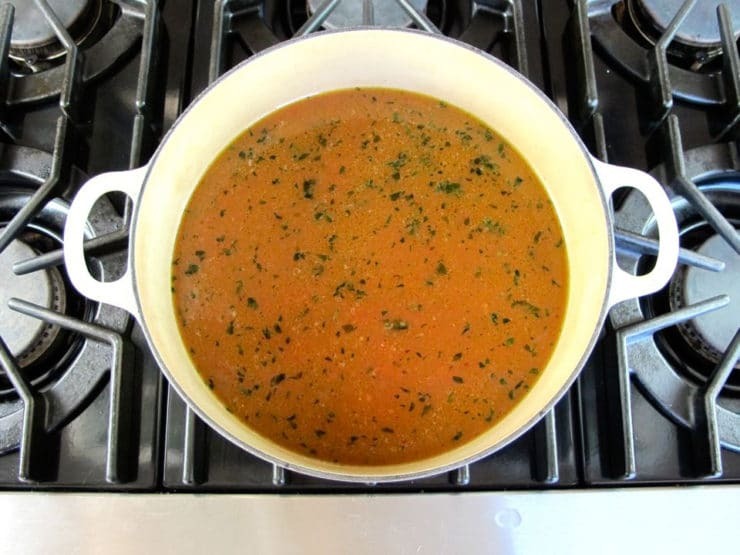 I love soups….of course, I would have to eliminate the salt. Chicken Gumbo was a childhood favorite. LOVE! Sauteed in butter, breaded and fried, pickled, in gumbo…pretty much any way I can get it! It is very interesting as I never come across of making Okra soup !! Here we called it Lady fingers, a very good and lady like name !! I learn that the slimy substance is good to our body !! We add in some Assam — Tamarind juice to stop the slimy. 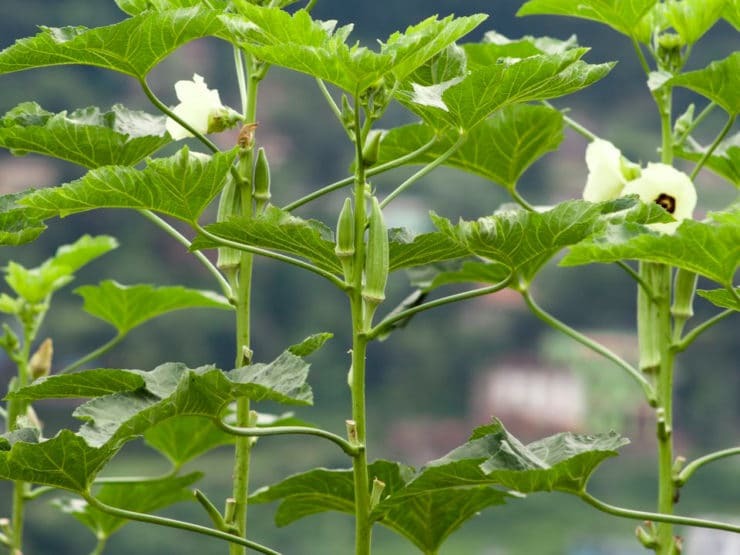 For better joints, soak 2 okra– sliced and put into a cup of water, stand it over night and drink the water the next day, it seem a lady was cured of painful knees after 1 week. I think it is the slimy substance that cure her knees .